Encapsulated in an ogive-shaped protective fairing, HS-4/SGS-1 has been positioned atop its GSAT-31 co-passenger — which was installed on the launcher’s cryogenic core stage during previous activity inside the Spaceport’s Final Assembly Building for Ariane 5. These successive integration steps enable a new series of preparation milestones to begin. They include the launch readiness review, which will be followed by Ariane 5’s February 4 rollout to the ELA-3 launch zone. Liftoff is scheduled during a 61 minute launch window that opens February 5 at 6:01 p.m. local time in French Guiana, with the two spacecraft to be deployed on a flight lasting 42 minutes. Ariane 5 will deliver a total payload lift performance of more than 10,050 kg. during the mission. Next week’s launch is designated Flight VA247, marking the 247th using an Ariane family vehicle since this European series of launchers entered service in 1979. It kicks off another busy year of activity for Arianespace, which has the objective of performing as many as 12 missions during 2019 with its full launcher family — consisting of the heavy-lift Ariane 5, medium-lift Soyuz and lightweight Vega. 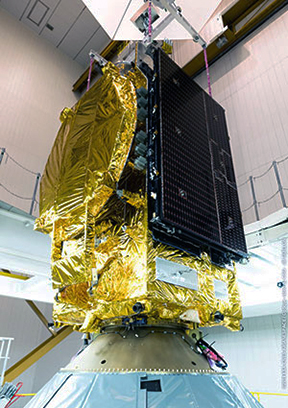 Saudi Geostationary Satellite 1/Hellas Sat 4 – to be deployed from Ariane 5’s upper payload slot – is a geostationary “condosat” for Saudi Arabia’s King Abdulaziz City for Science and Technology (KACST) and Greek-Cypriot satellite operator Hellas Sat. The satellite was designed, assembled and integrated by Lockheed Martin Space, with a coverage area that includes Europe, South Africa and the Middle East. 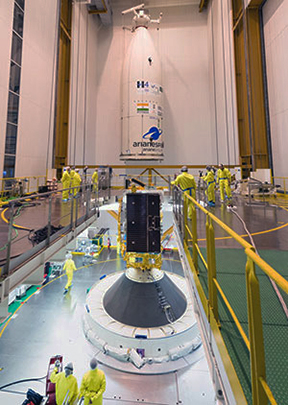 Riding in Ariane 5’s lower payload position, GSAT-31 — which was designed and manufactured by the Indian Space Research Organisation (ISRO) — will provide Ku-band communications services from geostationary orbit, helping bridge the “digital divide” with coverage across the Indian subcontinent.